Simulation is the new trend in the Android market. Understanding this as a norm, Nickelodeon has developed SpongeBob Moves In for Android – a simulation application game play, which has fetched an average rating of 4.0 out of 5 and more than a hundred thousand installations, since its inception of the Play Store. 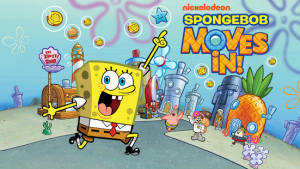 SpongeBob Moves In is a very slick game with a blend of strategy and graphics to keep avid players sticking in all the time. The user interface of SpongeBob Moves In Android game is intuitive and easy to navigate through. Once after successful installation, the launch of the game begins with an introduction of SpongeBob and assignment of tasks such as building of a pineapple house that needs to be done. After completion of every task, the game provides rewards like stars counted as happiness. The other important task in the game is to grow vegetables and satisfy the wishes of the inhabitants from time to time. Besides this, a player can send inhabitants to do specific stuff to get experience and money, which are needed to unlock new buildings and quests. Once a level is finished, new items and buildings will be unlocked automatically. The unique feature of SpongeBob Moves In for Android game is to make use of the money and rewards in construction of new houses, decorations and other stuffs. The app is compatible with both smartphones and tablets. It requires Android version 2.3.3 or higher. The app costs $2.99 as a single time payment to play the game. However, there are in-app purchases worth $0.99 to $99 per item to secure a bundle of stuffs to aids in completion of tasks in less time. SpongeBob Moves In for Android lets a player to perfect the art of fry cooking at the Krusty Krab to feed inhabitants and earn new and rare recipes. The graphics of the game are stunning and game-play is without any technical glitches. It’s really funny and very simple, you can build your own little under water town as you wish you like. You want to expand more and more, build more interesting houses and collect more residents. If you like city building game applications, secure a copy of SpongeBob Moves In from Google Play Store to build a town and accomplish all the tasks to unlock new levels of simulations.